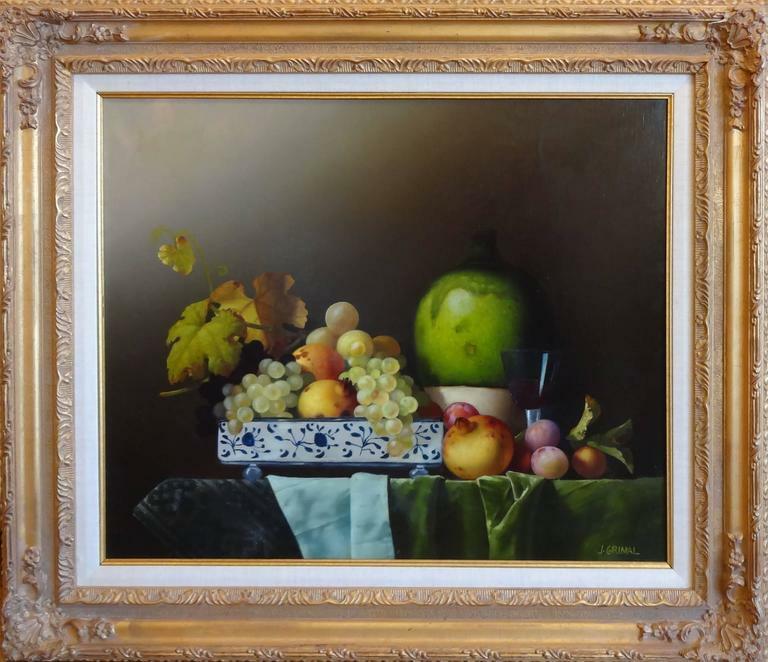 One of the remaining pieces in Jean Grimal's estate, this breathtaking piece is a gorgeous example of his mastery as an artist. 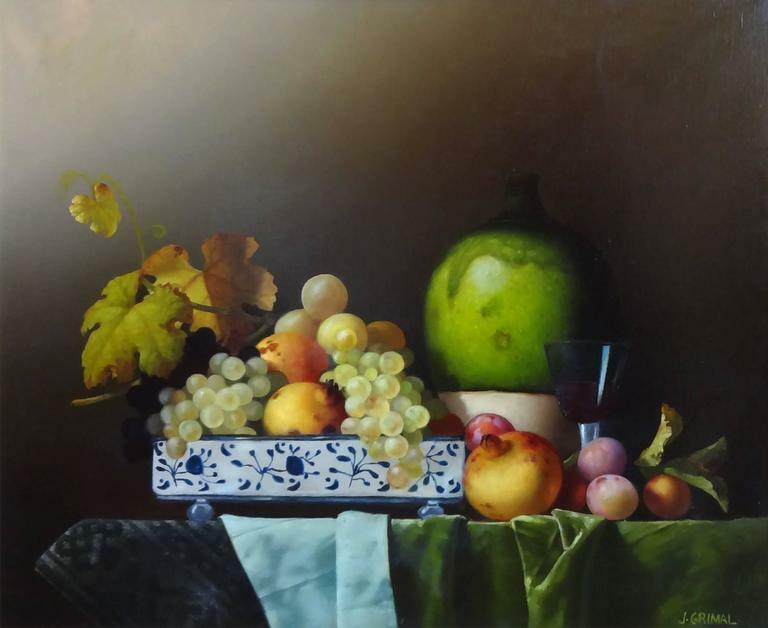 He beautifully creates chiaroscuro in this painting. The way the light touches the edges of the emerald table cloth is an example of his skill in representing light. 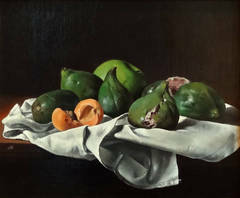 He paints the fruit exquisitely which rests on the table and in a blue and white dish. A wine glass sits on the table as well. A truly wonderful painting. Jean Grimal started his career as a teacher and an advertising illustrator. He worked with Lise Goldfard for more than 25 years at Studio 44 where they collaborated with major and important accounts, such as: Air France, Christofle, Peugeot, Lacoste, to name a few. At the same time he began presenting his formal paintings to galleries in Paris and Cannes, France and in London and Windsor, England. 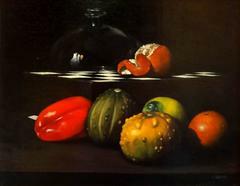 Much to his surprise Grimal found that his paintings were sought after by major art galleries and collectors throughout Europe. After a number of years of being an important and successful art illustrator for these major accounts he found himself having to choose between the two. 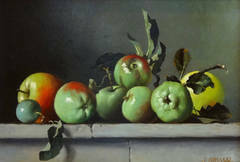 Fortunately for collectors he chose to dedicate his life to the classical style of painting. Jean looked at the simplest things in life through a microscope where he could take the simplest object and depict the age of the fruit or the leaf. 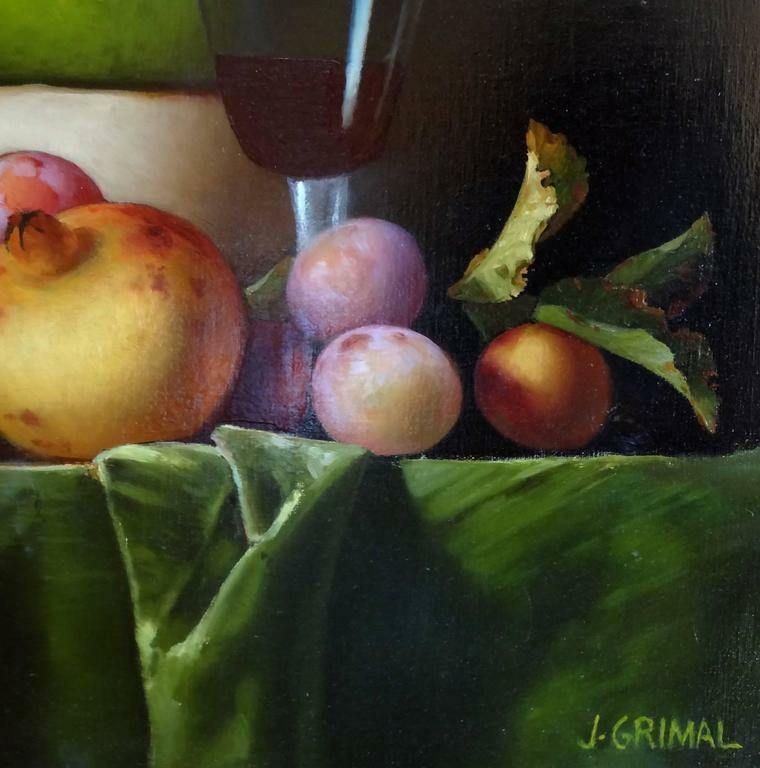 Jean Grimal's genius and skill has earned him the success and respect of collectors worldwide.